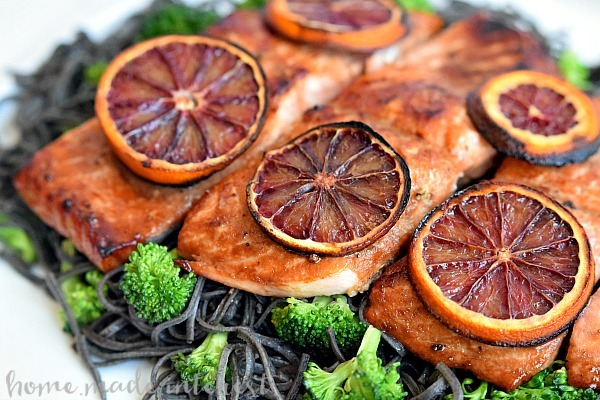 Blood Orange Glazed Salmon - Home. Made. Interest. 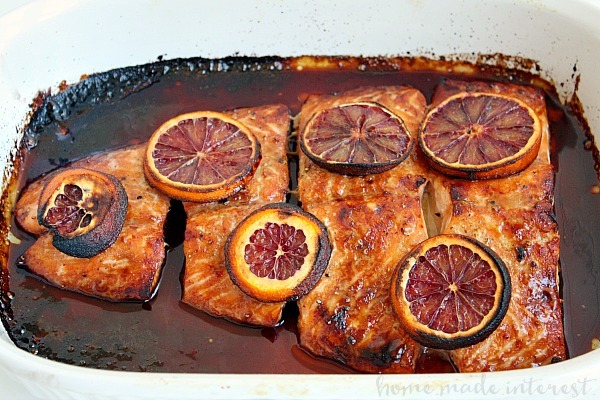 This Blood Orange Glazed Salmon is made with a sweet and salty blood orange and soy sauce glaze for a light, fresh fish dinner. I’m just going to let you look at this one for another minute before I get into the recipe because this may be one of the prettiest things I have ever made! There is nothing like fresh fish, fresh vegetables, and some beautiful citrus to make a dinner that looks great and tastes even better. I’m 100% Portuguese so eating fish is just a part of who I am. I will eat it cooked in just about any way but my favorite is simply baking it. Healthy Living Made Simple is an online magazine all about healthy and wellness. It covers so many topics but I really love reading through it every month because it always gives me a little inspiration for new, healthy recipes to try! 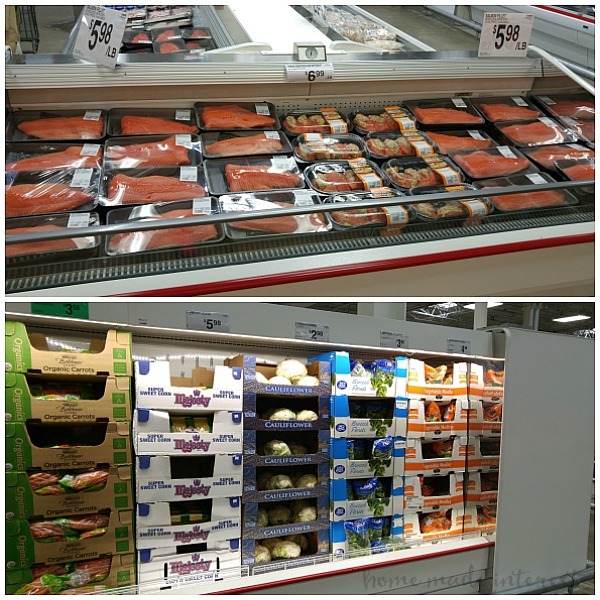 Their super food spotlight for March and April is salmon so when I stopped into Sam’s Club last week I had just read an article about all of its health benefits. Salmon is a great source of essential fatty acids, minerals like iron, calcium, selenium and phosphorus, as well as vitamins like A, B and D. Besides being good for you salmon also has a great flavor and it super quick to make because it only has to bake for about 15 minutes before it is cooked to perfection. When I saw this big, beautiful piece of salmon in the seafood section at Sam’s Club it was calling my name! I had bought blood oranges at the grocery store that week and I had been trying to come up with something to make with them. When I came home with this gorgeous piece of fish I thought a blood orange glaze would be the perfect thing for it. I made a simple glaze for the fish with brown sugar, blood orange juice, and soy sauce then thickened it up by cooking the liquid in a small saucepan until it was reduced by half. 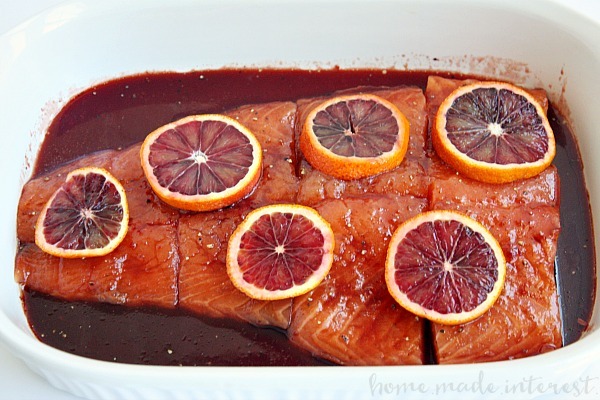 Next I placed the salmon in a large, greased, casserole dish, poured the glaze over the salmon fillets, and placed a few slices of blood orange on the salmon before putting everything in the oven. Like I said before, salmon doesn’t take long to bake and you want to make sure you don’t over cook it. I had a pretty big piece of salmon and it was cooked perfectly in about 15 minutes. The best way to check your salmon to see if it is done is to put a fork in it. The fish should easily flake apart. When I was at Sam’s Club I had also purchased a large bag of fresh broccoli. It is the one vegetable that my whole family can agree upon so I always buy it in bulk! It also happened to be the super food of the month for January and February in Healthy Living Made Simple Magazine! I added a little butter to a skillet and quickly sauteed it right before the fish came out of the oven. I also had some black bean noodles that I had gotten at the grocery store. I boiled these and then added them, and the broccoli along with a little of the sauce from my salmon dish to the skillet and tossed everything together. 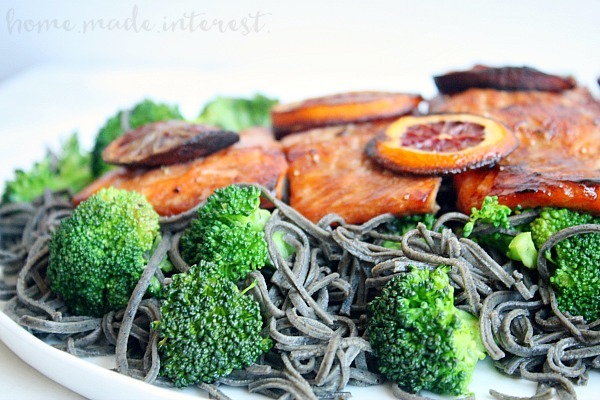 I ladled my noodles and broccoli on to a big dish and served my salmon right on top of it. Just look at that! It was such a beautiful meal, everyone loved it, even the kids, and it was so simple to make. 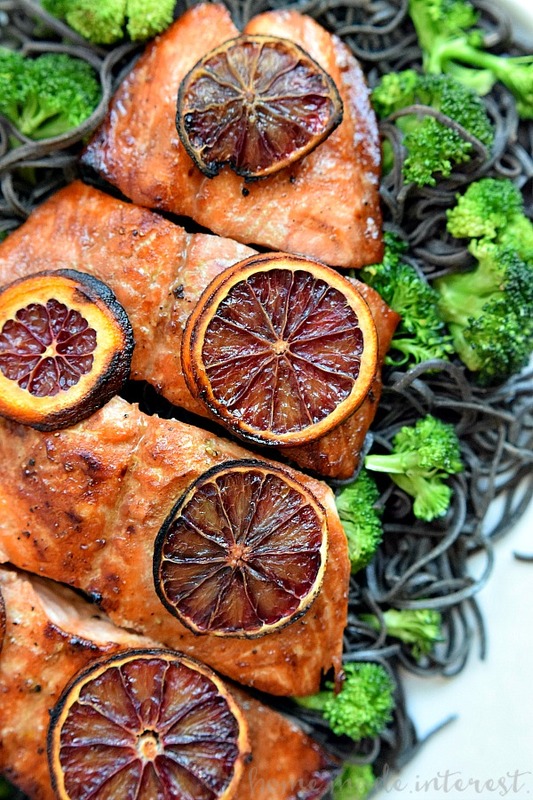 Fresh salmon, fresh broccoli, and some noodles, covered in the bright, slightly sweet flavor of a blood orange glaze. This is a new favorite in my house and I can’t wait to make it again! 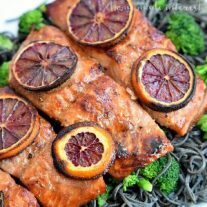 This easy salmon recipe is made with a sweet and salty blood orange glaze for a light, fresh fish dinner. Grease the bottom of a casserole dish with olive oil. Also rub the salmon fillet with olive oil and sprinkle with salt and pepper. 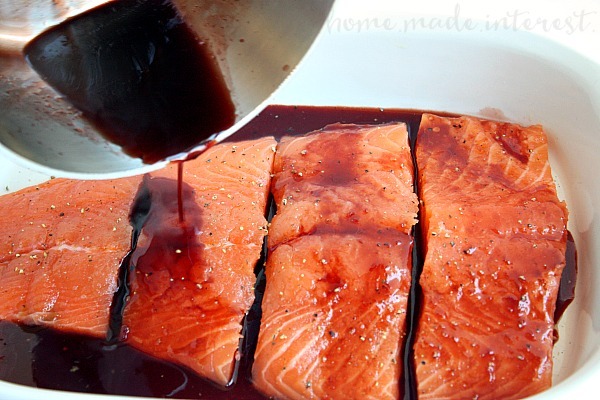 In a small saucepan, bring the blood orange juice, brown sugar and soy sauce to a boil. Cook liquid until reduced by half. 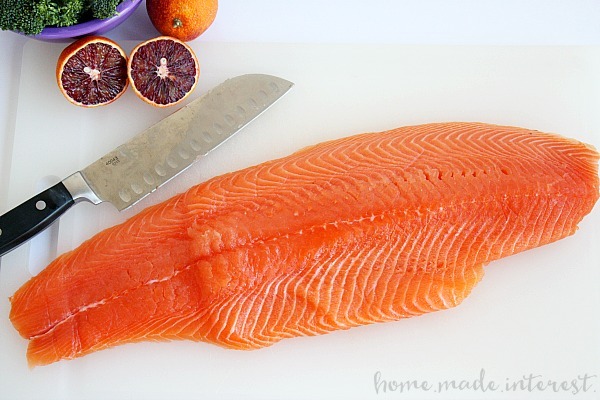 Pour the sauce over the salmon and place the fresh blood orange slices on the salmon. Bake the salmon for about 15 minutes, or until the fish is done to your liking. You can flip the blood oranges over halfway through if they look like they are burning. You know the salmon is ready when it easily flakes apart with a fork. Sam’s Club cares about its members and their health and wellness. They offer healthy food and drinks, free health screenings, optical, hearing, over the counter medication, etc. It is everything your family needs to stay happy and healthy all in one place. Make sure you check out the next issue of Healthy Living Made Simple magazine and then head to Sam’s Club to stock up! 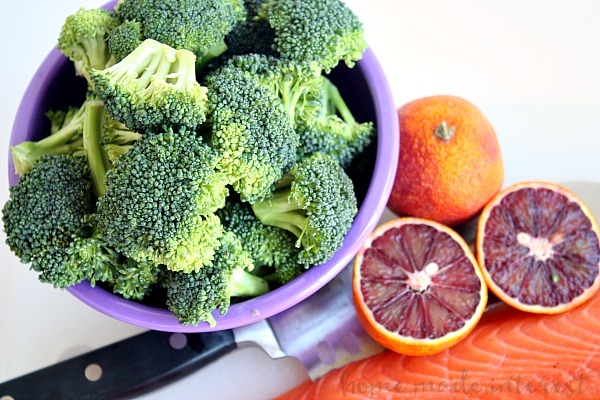 This recipe looks so delectable – I would have never thought of using blood orange juice! I don’t get to buy fresh seafood too often, but I’d love to try this next time I do! Thanks for sharing this, found you at Linky Palooza!